Modern Standard Arabic, or MSA, is the standard, formal, written form that is used and understood throughout the Arab world. While primarily written, MSA is also spoken in highly formal situations, in higher education, in sermons, and in the courts of law. The Pimsleur® Method: the easiest, fastest way to learn a new language. Completely portable, easily downloadable, and lots of fun. You’ll be speaking and understanding in no time flat! Each lesson of Modern Standard Arabic Phase 1, Unit 01-05 provides 30 minutes of spoken language practice, with an introductory conversation and new vocabulary and structures. Detailed instructions enable you to understand and participate in the conversation. Each lesson contains practice for vocabulary introduced in previous lessons. This approach for learning a language is very effective. There is lots of repetition, help with pronunciation, and practical, daily uses of the language. I take a weekly in-person Arabic class, which has me focused on grammar rules and which makes me unable to produce the language due to the complexity of the grammar rules, This audio book has enabled me to actually produce the spoken language. If you are a stickler for grammar details, using just this audio book might stress you out since you might not understand some of the finer details. But if you are willing to learn the grammar a bit organically (or if you pair the book with a class as I do), you'll do great. I highly recommend it. 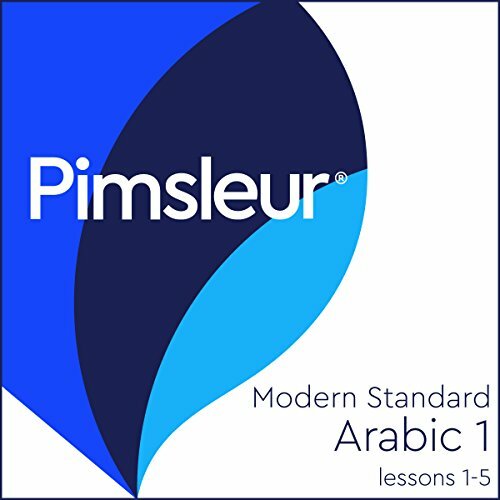 Pimsleur has been such a great language tool that both me and my husband bought the full 30 lesson set in our chosen language. My husband finished the first 25 lessons in a month and can now speak Greek in complete sentences. I have been less consistent, but in a month I have still learned basic phrases needed for travel in Arabic. If you are not ready to commit fully to a language program this five lesson set is a great way to test out if pimsleur will work for you. The key is doing a lesson every day, sometimes I need to repeat lessons two or three times before moving forward. I don't have much time working an average of 10 hours a day and a bit on the weekend. This course is suitable to learn for at least 30min each day especially while stuck in traffic for more than an hour. I find that repeating a unit once il really does wonders. Next day your memory is great. this book is very well organized. I feel that I have a good start on the language. I really like the way this method works! Great development of vocabulary and understanding of grammar. It keeps me engaged without getting bored. I wanted to try the first book as a test run, now I'll be purchasing the entire series. Learning Arabic is very difficult for me but this system makes it possible. Great job! OK, but impossible to definitively make out consonants from the audio. It needs written backup. I thoroughly enjoy it, and there is so much repetition interspersed throughout the audio that you can't forget it. Really good and is modern standard Arabic too, which is understood in all Arabic countries. Good to hear native pronunciation. Tried and tested system so don't hesitate, try it out and put the time in. I did know nothing of Arabic.. Within thgthge fursdfursdt two lessons I could have a very short conversation with my work colleague who speaks fluently. She was so impressed she asked me if I had private lessons foir s few months. Results in a few days and you don't forget it .very good methods. What did you like most about Arabic (Modern Standard) Level 1 Lessons 1-5? What other book might you compare Arabic (Modern Standard) Level 1 Lessons 1-5 to, and why? What does Pimsleur bring to the story that you wouldn’t experience if you had only read the book? Great starting point - 30 min a day each lesson - great for listening on the way to work.